The Daily GRRR! HEADLINES for Feb. 26, 2015. 1. Mount Polley disaster ignored as B.C. government gives go ahead for new mine. 2. B.C. Chiefs decry anti-terror bill’s “explicit natural resources development agenda”. 3. Lakehead makes indigenous knowledge course mandatory for all degrees. 4. Residential school survivors fight federal gov for documents that prove abuse. 5. Racism plagues indigenous students at Ontario high school on Manitoulin Island. 6. Biracial actress rocks dreadlocks at the Oscars, calls out E!’s racist Fashion Police. 7. 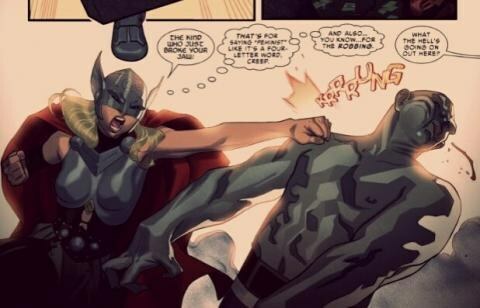 New female Thor packs a feminist punch to challenge misogyny in comic books. Welcome back to SoundFM! You are now listening to The Daily GRRR! on the air every weekday morning from 9-10 a.m. here at 100.3fm, CKMS in Waterloo, Ontario, and SoundFM.ca on the web. This is Kathryn and I’ll be your host on this Thursday morning show for February 26th, 2015. As many of our listeners already know, Imperial Metals' Mount Polley mine caused B.C. 's biggest-ever mining disaster last August as a result of its own negligence and bad design. Now, as reported by SumOfUs.org, B.C. Premier Christy Clark has given Imperial Metals a temporary permit to open the Red Chris mine, a new copper and gold mine with a much bigger, more toxic tailings pond in the pristine Stikine River watershed. A final investigation on the Mount Polley disaster came to light recently, confirming that the tailings pond’s poor design was to blame for the environmental disaster. Imperial's negligence caused a massive spill of toxic waste into the Mount Polley Lake, which will take years and millions of dollars to clean up, and even then there may still be lasting effects to the local ecosystem. Imperial Metals has provided little reassurance that an even worse catastrophe than Mount Polley won't happen. An independent review of the Red Chris mine plans revealed a host of problems with the tailings pond design, including serious risk of seepage and leakage, and vulnerability to landslides. The review found there were no emergency response plans, no operating, maintenance and surveillance manuals for the tailings facility, and no studies to detail what would happen if the dams collapse. In short, the Red Chris mine is an environmental disaster waiting to happen, and the B.C. government just gave it the go ahead. As reported by APTN News, survivors of a residential school that used an electric chair to torture students are returning to court in another effort to force the federal government to release uncensored documents from the investigations and criminal trials of former school staff. Lawyers representing the survivors, who as children attended St. Anne’s Indian Residential School in St. Albany, Ontario, filed a “Return of Request for Directions” in December in order to clarify a previous ruling from January 2014, when the Ontario Superior Court ordered the Canadian government to disclose documents it held in its possession from an OPP investigation into physical and sexual abuse at the residential school. Ottawa initially denied it had the material, but eventually handed over 12,300 electronic documents related to the OPP investigation. However, according to the most recent court filing, the documents from Ottawa have been heavily redacted. These documents are important for St. Anne’s survivors who are involved in the Independent Assessment Process (AIP), which was set up to hear claims and issue financial compensation for sexual and physical abuse suffered by residential school survivors under the multi-billion-dollar Indian Residential Schools Settlement Agreement. St. Anne’s survivors need the documents to prove their claims of abuse to IAP adjudicators. Naturally, the redactions by the Canadian government are making it difficult for survivors to use the documents in their cases, and the fact that the federal government acts as an additional party involved in the IAP hearings indicates that this could well be a deliberate measure to sabotage any chance for the survivors from St. Anne’s Residential School to receive financial compensation, which in and of itself can likely never make up for the trauma inflicted on them at the direction, ultimately, of the Canadian government itself. As reported by Raw Story, over the summer, Marvel announced that the long-running character of Thor was going to be replaced by a woman in their comic book universe. The writer, Jason Aaron, made it clear that this woman is not going to be like a She-Hulk or Spider-Woman, both of which are entirely separate characters who co-exist with their male counterparts, but an actual replacement for Thor: “This is not She-Thor. This is not Lady Thor. This is not Thorita. This is THOR,” he wrote in the Marvel press release. “This is the THOR of the Marvel Universe. But it’s unlike any Thor we’ve ever seen before.” For people who read a lot of Marvel comics, this wasn’t too surprising. It’s common for superheroes to die or retire or get promoted and leave their mask and mission to someone entirely new, much as you see with your ordinary desk jobs where different people can hold the same title over the years. But since it’s a lady and there’s a loud and shameless sexist corps in the geek world, there was a major and irritating outcry from some fans. Fortunately, the misogynistic woman-haters and anti-feminists aren’t going to be too happy to see the new panels that Marvel has released as teasers for the upcoming comic. Thor isn’t just a lady superhero but a feminist, and her nemesis, the Absorbing Man, has dialogue that could have been culled from the offensive comments section underneath any feminist article on the internet. We’ve linked to them here on the podcast page for today’s show so you can take a look for yourself.